17th Annual Shop Hop - “Quilting the Blues Away"
Blankets for Preemies, Fri, Mar 18, 11:00 a.m. - 3:00 p.m.
Handwork Sit & Sew, Mon, Mar 21, 10:00 a.m. - 4:30 p.m.
American Girl Doll Sit & Sew, Thu, Mar 24, 1:00 - 4:00 p.m.
Baltimore Album, Sat, Mar 26, 10:00 a.m. - 2:00 p.m.
(This is an ongoing class, but you can start at any time. Marti Michell BOM (full), Sat, Apr 2, -OR- Thu, Apr 7, 10:15 - 10:45 a.m.
April - Sat, Apr 9, 9:00 a.m. - 2:00 p.m. -OR- Tue, Apr 12, 9:00 a.m. - 2:00 p.m.
Spicy Spiral Table Runner, Martha Kunkel, Fri, Mar 25, 10:00 a.m. - 4:00 p.m., $40, supply list, including pattern. We love this table runner! It's fun to make (not as hard as it looks), and the results are dramatic. It's great to make in holiday fabrics or use one of your favorite groups of fabrics for beautiful results. The Halloween version is shown her. It would be pretty with florals for Spring or red/white/blue for the Summer. Machine Quilting with Your Walking Foot, Beth Kondoleon, Tue & Wed, Mar 29 & 30, -OR- Thu & Fri, Apr 21 & 22, 10:00 a.m. - 1:00 p.m., $40, supply list. Can't quite get the hang of free motion quilting? Come join Beth as she shows you how to quilt with your walking foot. You will learn some basics of the walking foot, then move on to do some matchstick and crosshatch quilting. We will explore using some of your decorative stitches along with quilting some curves, circles, and radiating designs. Beth will demonstrate which templates you can use to make life easier. So come join the fun and start quilting those tops! 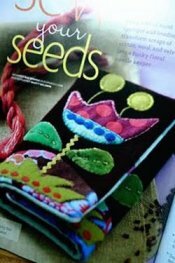 Sew Your Seeds Needlecase (Sue Spargo), Judy Cummings, Thu, Mar 31, Apr 28, May 12 & 19, 9:00 a.m. - noon, $60, supply list, including pattern. Sue's funky floral needle keeper was featured in 'American Patchwork and Quilting' magazine. It is a tri-fold, so it has lots of room for all your handwork needles. This is a great class to learn wool applique, layering, and embellishment. Beginning Free Motion Quilting, Beth Kondoleon, Sunday, April 3 & 10, 12:30 - 3:30 p.m., $40, supply list. Want to learn how to free motion quilt on your home machine? Come join the fun with Beth as she teaches you the basics in this beginning level class. She will introduce you to several stitches along with tips and tricks for free motion quilting. 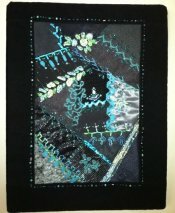 Crazy Quilting - Continuing, Toni Jordan, Sun, Apr 24, 12:30 - 3:30 p.m., $20. This class is for those who have taken Toni's "Beginning Crazy Quilting" class, and want further instruction on embellishment stitches. Bring your block to class and Toni will help you with your stitches. 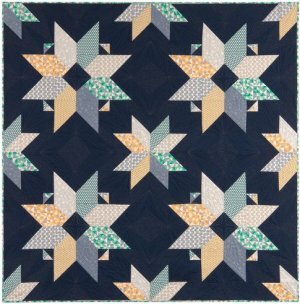 Foundation Paper Piecing - Advanced, Linda Bergman, Wed, May 4, 10:00 a.m. - 2:00 p.m. and Wed, May 18, 10:00 a.m. - 4:00 p.m., $45, supply list, including pattern. It's here! This is a class many of you have requested -- an experienced teacher to show you how to make a Judy Niemeyer foundation paper pieced quilt. Linda has made several Judy Niemeyer quilts and has taught this class for many years. 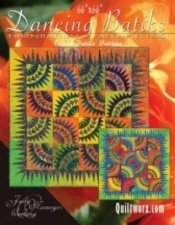 You will use Judy Niemeyer's "Dancing Batiks" pattern, and you can make the quilt with batiks, as shown on the pattern, or you can make a "scrappy" version, like Linda's sample. Tuffet Class, Jill Schlageter, Wed, June 8 & 15, 11:00 a.m. - 2:00 p.m., $60, supply list (pattern required for class). Tuffets are all the rage! They can be whimsical, elegant, scrappy, or made to match any room. This is a 2-session workshop, and you'll have a completed tuffet at the end of the class! Session 1 is sewing and learning the technique to make the foundation pieced Tuffet cover. Covers are finished at home prior to Session 2. In Session 2, we assemble the upholstered form. The instructor will bring the tools needed for construction. Tuffeteers can purchase one of the instructor's finishing kits ($125) or gather the materials themselves. Pattern purchase is required ($28). You must be an intermediate quilter/sewer and have a good working knowledge of your sewing machine. Crazy Quilting - Beginning, Toni Jordan, Sunday, June 26, 11:00 a.m. - 3:00 p.m., Sunday, July 3&10, 11:00 a.m. - 1:00 p.m., $65, supply list. In the first session you will construct a 14" block using a wide variety of fabrics; cottons, silks, tapestries, velvets, linens. In the second session you will start the embellishments. You will learn a variety of embroidery stitches using different threads and techniques. In the third session, you will learn more embroidery stitches and embellishment techniques using buttons, laces, jewelry and other "finds". We've received flannels, new batiks (including batik stripes from Robert Kaufman), Dimples, solids, white-on-white blenders, and lots of fabrics from Westminster (the company for which Kaffe Fassett designs). Also from Robert Kaufman, we have the Fragmental line, and they loaned us a quilt made with these fabrics, pictured below. It's even more beautiful in person -- the quilting is stunning!